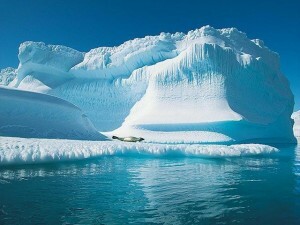 Glacier Melting - Do you see Another Sign of Impending Doom? Global warming and glacier melting are both happening. Unfortunately, the cliché is the truth. We already yearn for these majestic rivers of ice that have graced our landscapes for millennia. Most of them shrink every year. We have photographic evidence in some cases of the barren land left behind by the receding ice. In this day and age you can even see video coverage of this ice breaking apart and drifting away. People watch in awe and in horror. These storehouses of fresh water for many of the world's people, including the poorest people, have begun to disappear. Where are they to get their water supply once the melting glacier source dries up? How did that water get up there in the first place? This question reminds me of the time I visited the Columbia Ice Field, a glacier source in the mountains of western Alberta. It was summertime and melting rapidly with water gushing in high-speed channels and such. Looked like climate change right at my fingertips. Where did it come from? We can also see the shrinking caps in Greenland and Antarctica and global warming gets the blame. And rightly so, too. The temperatures recorded by our meteorological stations have shown a definite and real increase over the last 100 years or more and it makes sense that visible evidence of this warming should show up sooner or later. The temperatures shall continue to rise and the world's ice reserves will shrink further. The world as we have known it no longer exists. Has this ever happened before? Well, nobody knows for sure, but the data we do have seems to suggest that it has been warmer on earth many times in the past. It's also been a lot colder, too, with arctic weather all over the planet. Too warm would probably be preferable. Nature is adaptable. And though many species in the past have disappeared permanently, and though that is also likely to continue, the ecosystem as a whole has not perished. Melting glaciers is a sign of changes occurring. Changes have always occurred and always will. Nobody knows why, for sure. We have ideas, maybe even on how to halt the changes, but no definite answers. We have just got to keep on keepin' on and make sure we adapt to whatever the world dishes out. We can do it like no other species could ever before. Good luck to us. Go back from Glacier Melting to the Solutions Global Warming page.